At this meeting place you can join in actively and participate interesting messages for other yachties, present your boat and your photos and rate or comment marinas. Messages: Here you can announce hazard areas, navigational information, events for sailing- and boating-fans or just coastal-talk. At the menu item "Messages" you can simply click at "add message" to inform other users and position it at the map. Rate and comment marinas: Click on a marina-icon and you are at the marina-sheet. At the menu item "comments" you may announce your rating and comments about this marina. My boat: Portmaps offers you the possibility to present your own boat and place it directly at the home-marina on the map. Just register, go to the menu item "Boats" an already you may upload information and photos of your boat. 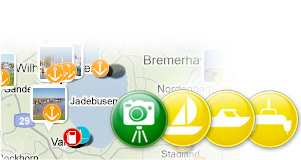 Then an icon on the map shows your boat to other Portmaps-users. My Images: Here you have the possibility to share your photos of ships, marinas or sailing-trips and place them directly on location on the map. If you are signed in at "My Portmaps" it is easy to upload your favorite photos at the menu item "Images". We convert the photos in different sizes and they will appear immediately on the map.